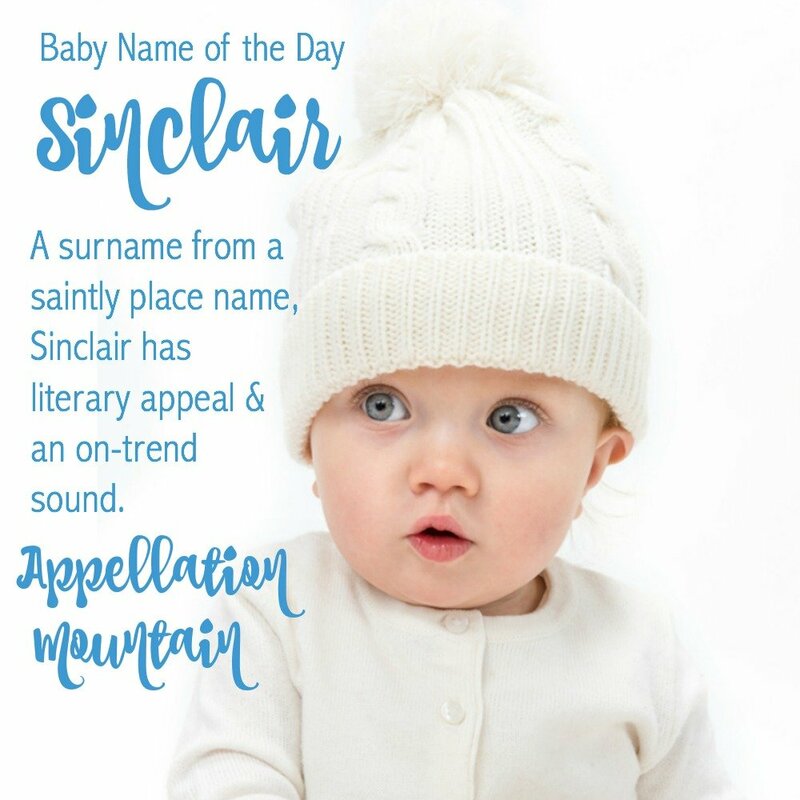 Sinclair is a saintly surname found on the map. 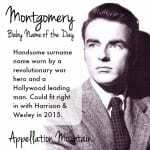 Thanks to Sarah Winter for suggesting our Baby Name of the Day. Many places were named after popular saints. Some of those place names became surnames, and a few migrated to given name status. You might assume that the place names refer to the famous Saint Clare of Assisi. Not so! While Saint Clare is quite popular today, she didn’t live until the thirteenth century. William Saint-Clair-sur-Epte was among the companions of William the Conqueror in 1066. By the time Saint Clare founded her religious order, this name was already on the map. Before Clare of Assisi, there was Saint Clarus of Nantes, the first bishop of the city in the late 200s. Sometime between the 700s and 900s, a second Clarus left his home in England, travelled to Normandy, and incurred the wrath of a noblewoman. She had him killed, and he, too, became a saint and inspired at least a few of the place names. Back to William Saint-Clair-sur-Epte: in Norman England, Saint-Clair was smooshed into Sinclair, with various spellings in use. The family made their mark in Scotland, where Clan Sinclair remains significant. Malcolm Sinclair, 20th Earl of Caithness, is the current Clan Chief, and the family appears throughout Scottish history. There’s something literary about this name, thanks to two different writers. Upton Sinclair was a muckraking journalist known for his 1906 novel/expose The Jungle. Sinclair Lewis, best known for Main Street, Babbitt and Elmer Gantry, won the Nobel Prize in Literature in 1930. He was the first American to do so. He was born Harry Sinclair Lewis, but preferred his middle name. The Sinclair Oil Corporation is known for its smiling green brontosaurus logo in the American west. The 1990s television series Dinosaurs gave this name to the dino family at the center of the show. Other characters had petroleum-inspired names, like Ethyl and Hess, leaving no doubt as to the inspiration. Speaking of the 1990s, if you remember Living Single, you might recall that Kim Coles played an aspiring actress named Synclaire James. A very few girls were given the name with this unusual spelling during the 1990s, but it never really caught on. The question is whether this name is better for a boy – as in the literary Lewis – or a girl. After all, Claire is currently a solid Top 100 choice for a daughter, as are surnames like Harper and Piper and Madison. As of 2015, this name was given to 10 boys and 17 girls – so unusual that it’s impossible to say it’s a girls’ name or a boys’ name, because right now, it’s just a very, very unusual one. If you’re looking to name a son after a Claire or a Clara, this name emerges as a possibility – it’s not so different from Spencer. But it’s an equally intriguing idea for a daughter, just like another Scottish surname – Mackenzie. Overall, this is a rarity that feels nicely on-trend, and could work regardless of gender. Do you like Sinclair better for a boy or a girl? This post was originally published on April 9, 2009. It was substantially revised and re-posted on June 16, 2016. I chanced on this site as I was trying to figure out where the name came from – since I didn’t ask my parents when I could. These comments are from a 78 year old male whose first name has been Sinclair since day one. The name has given me one distinctive advantage – people remember my name, and by extension me, because it is unusual. In later life that benefitted me greatly. In my working life it was important that I stand out among the crowd. As a somewhat introverted person and with a thoroughly average appearance, the name plus my voice did it. I have often been asked if I was ever a radio announcer. The other affect is because my name is coupled with a last name which is usually a first. It is often transposed. When it is important for it to be in the correct order or if I know I will see the person again I will tell them that my first name is Sinclair and that ——– is the last. Apologies follow to which I usually reply “that’s OK, you are only the millionth person who has done that. I suppose this might bother some but not me. Anyway, my advice about the name – go for it. Thank you for sharing your experience – and your endorsement of a great name! I could see Sinclair being the next Blair and going over to the girls…especially with the “clair” ending. I really like Sinclair. I think it sits better as a boys name-would live to have a gradchild named this way to honour me one day. I dont find the ‘sin’ part an issue. I dont mind if its a name used in your family and I know it has been used on males in the past, but I dont think Clare can be considered a boys name anymore. Its not the male version of Claire; its the Irish spelling as opposed to the French and is also a place name. I love that Sinclair is all masculine and medieval, while still remaining soft around the edges and romantic. I have this name on my short list. He is the last name on my short list, though. Right under Sophronius and Cornelius. The masculine Clare and the feminine Claire/Clairie are on my family tree. Probably one of the few lesser obscure names, next to Jessica, Sarah, and Rebecca, that I found easy to use to honor family, yet, have easily accessible and recognizable gender spellings without worrying. Most of my family recognizes Sinclair, I can thank the oil company for that since they had one in their home town in OK, as oppose to our other name choices on our long and short list. Our number one choice is Tancrede, yet, Sinclair is far more recognizable than our number one choice by everyone whom we have mentioned it too. So I hope that reassures the parents considering Sinclair for their little boy. This name is like Grayson, watch it, it won’t stay under the radar for too long. Partly, the reason why it is last on our short list. Thank you for doing a work up on this name. I like Sinclair a lot! I think it makes a great boys’ middle name because its stress is on the second syllable (like Marie for girls). The “sin” part doesn’t bug me as much as it does with St. John — again, I think it’s about where the stress falls. We say sin-CLAIR, not SIN-clair, so the “sin” part isn’t quite as strongly highlighted. Annelise, I know what you mean about Sinclair. If our second had been a boy, I was wondering how to honor my mother anyhow, possibly by using Sinclair as a middle name. (Though I was leaning towards using Clare in the middle spot – it used to be masculine, after all!) As it happens, this post partly honors my mother – 4/9 is her birthday. And JNE, I didn’t think about the Madison connection until I started writing this, when it leapt out. I recently discovered that Emerson is, indeed, climbing the charts rapidly and so I’ve been wondering what other surname names might gain in the next few years. For me, the biggest barrier to Sinclair is the word “sin.” But Lola, I’d say I’m not wild about that fact for either gender. I’d use him in the first spot and wouldn’t care. No boy name seems sacredly all boy. I’ve seen Wayne on little girls birth announcements and Wayne is my husband’s middle. Plus, Wayne is an occupational surname for wagon maker. I jump on it ahead of the curve that way every person in your life who comes in contact with your child will be educated and this leaves them less judgy. Oh please, no Sinclair girls! Sinclair strikes a singularly masculine edge and hangs there easily. Why would you want Sin- right at the front of your girls name? Baffling. I do like Sinclair, he’s pretty snazzy to me. I like that he’s NOT an n ender, yet again. I also like his feel, sharp, crisp and strong. Very nice, indeed. He’s a bit too surnamey for first name use for me but, like Sterling, he may show up the middle! I firmly like Sinclair. He feels current but is quite old and Yeah, he’d be right at home today. That makes a winner, for me and yes, I’m still a sucker for girly sounding boys names… Sinclair fits that as well! Sinclair doesn’t excite me. I hadn’t thought of it being the next Madison until Verity brought it up and that kind of puts me off even more; I’m just not a bit fan of the gender neutral names… and even though this isn’t there yet, it just adds to my tepid feelings for the name. It’s not that I actively dislike the name, but well, I don’t really like it either. It makes for a nice surname and I’d be just fine with it staying in the final spot.